I hope this week has treated you well & that you enjoyed my "Ten on Tuesday" post that I've decided to start doing weekly. I'm going to link several of my favorites that are available right now at the bottom of this post, so check them out! Today's post is all about my favorite drugstore products; because let's be honest-as much as I love designer and high end finds, oftentimes you can find great options right at your local Target, CVS, Walmart, or Walgreens. *Some of the links below are affiliate links-thanks for supporting Southern & Style! Y'all, I'm always up for trying new hair products (I have absolutely no brand loyalty when it comes to hair care), so when I got the opportunity to test out the moisturizing shampoo and conditioner from Finesse, I jumped at it. The ends of my hair are so dry and fried because of using my flat iron way too often, so I always need to add more moisture. While the conditioner worked pretty well, the shampoo was the best part for me. It balanced my hair without weighing it down and left the best scent ever. Big bonus? It's less than $5 at Walmart. This is the lip balm that I keep by my bedside and I love it so much. It's got a great minty scent and it moisturizes your lips without sucking the other moisture out of them like other lip balm products have a reputation of doing. My husband even likes it so much that he tried to steal it from me the other day, and that's saying a lot! I fell in love with this body butter when I got a sample inside a Target Beauty Box and I've not been able to turn back since then. The scent is so yummy and the cream is so rich and luscious. Take a hint from me and treat yourself to this drugstore gem. This may be cheating, because even though you can buy it at Target (technically making it drugstore in my eyes) it's still pretty pricey. But here's my two sense-you need to invest more in skincare than other things because if your skin doesn't look good, makeup and everything else won't help it. This eye cream is just over $20, but a little goes a long way and it keeps my under eye area so hydrated and combats my dark circles. I don't usually like drugstore eyeshadow, it's usually not pigmented and I'm just not a fan. But this palette is one of my only exceptions...so much of an exception that I've hit pan on almost five out of the ten shades. It's the perfect mix of matte and shimmer, of darks and lights and mid-tones. It does kick up a good bit of powder when you dip in your brushes, but if you remember to tap them off you're golden. Covergirl sent me a couple of new mascaras to try and honestly, I have a ton of mascaras that I haven't opened yet because I don't want them to dry out before I can use them up, but I was so curious about the brush on this one that I had to open it up and test it out. The mascara was really, really wet when I first opened it...so I hated it. But after I let it dry out for a week or two, I really like it. It's hard to work the brush on my left eye, but I work with it because it holds a curl so beautifully and adds both volume and length without adding clumps. It also layers well with my Mary Kay mascara over it, so that's always a bonus. Well guys, that's all for today! A big thank you to Finesse for providing me with product in exchange for an honest review. All opinions are my own. Thank you for supporting brands who support Southern & Style. 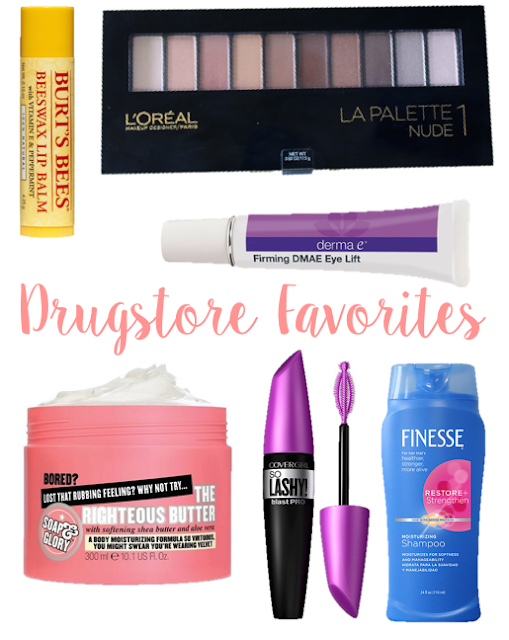 I love drugstore items such a great price and some amazing products! I love Burt's Bees, especially their lip balm! I use Finesse and Burt's Beeswax all the time. Another drug store find of mine is Pond's cold cream. Pretty blog. I love Burts Bee! Probably my favorite chapstick! Always loved Burt's Bees! Great post! I love burt's bees! I'll have to check out the others you mentioned! Oooh, that body butter sounds amazing, lady! I am a regular user of the Burt Bee. I like the other too.